Like a scrummy slice of hot pie? How about a slice of laughter? This bad bear will gobble up – oops, we mean tickle your ribs. Om nom nom. It’s a scrummy new rhyme by the talented team behind Never Ask a Dinosaur to Dinner. More fabulous chuckles. Even funnier pictures. 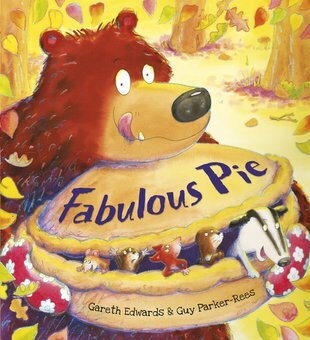 But we wonder: should they have called this book Never Bake a Pie with a Bear? Deep in the forest, a naughty grizzly is baking a pie. The woodland animals are helping him find the perfect filling. They bring him yummy berries, nuts, honey and salmon. But this bad bear has something else he’d like to put in it. YOU.